Maria Goretti died a martyr before her twelfth birthday. Young as she was, she made a choice, a choice based on her faith. The Church holds up to the world the life, death and the faith of Maria Goretti. 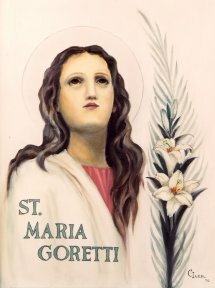 Oh Saint Maria Goretti who, strengthened by God’s grace, did not hesitate even at the age of twelve to shed your blood and sacrifice life itself to defend your virginal purity, look graciously on the unhappy human race which has strayed far from the path of eternal salvation. Teach us all, and especially youth,with what courage and promptitude we should flee for the love of Jesus anything that could offend Him or stain our souls with sin. Obtain for us from our Lord victory in temptation, comfort in the sorrows of life, and the grace which we earnestly beg of thee (here insert intention), and may we one day enjoy with thee the imperishable glory of Heaven. Amen. October 16, 1890: Maria Goretti is born in Corinaldo, Italy to Luigi Goretti and Assunta Carlini. October 17, 1890: Maria Goretti is born in Corinaldo, Italy to Luigi Goretti and Assunta Carlini. October 4, 1896:Maria is baptized in the Church of San Francesco in Corinaldo. July 6, 1902: Maria dies at the age of 11 years, 9 months and 21 days, after forgiving Alessandro. April 27, 1947: Maria is beatified by the Roman Catholic Church. June 24, 1950: Maria Goretti is declared Saint in St. Peter’s Square by Pope. Both her mother and her killer, who had converted to the Catholic faith, were in attendance. Lured by the passions of his day and nurturing the dark side of his soul with impious reading and thoughts, Alessandro Serenelli had been a thorn in lovely Maria’s side. He propositioned her on several occasions and harassed her with impure suggestions. On July 5, 1902, he would be denied no longer. As she once again rebuffed his sexual advance, shouting, “No! It is a sin! God does not want it!”, Alexander lunged to the deed, stabbing Maria 14 times. Doctors in Nettuno tried to save Maria’s life to no avail. After 20 painful hours of suffering during which she forgave and prayed for Alessandro, Maria entered Heaven fortified with the Last Sacraments. Her last earthly gaze rested upon a picture of the Blessed Mother. It was July 6, 1902. Almost fifty years later on June 24, 1950, Pope Pius XII stood on the steps of St. Peter’s in Rome and pronounced Maria Goretti a Saint and Martyr of the Universal Church to half a million people. He proposed her as the Patroness of Modern Youth and set July 6th as her feast Day. Her mother, and her murderer, attended the canonization ceremony together.